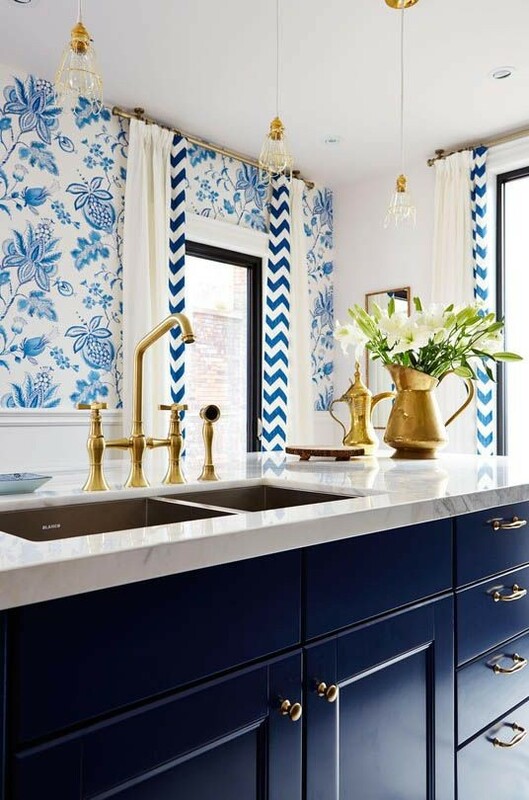 Did you know that according to interior designers blue color is one of the most popular choices for kitchen cabinets (after white, of course)? The color of heaven and ocean is so inspiring that it is not in the least surprising. And we’d like to show you 20 absolutely different kitchen sets in this color. 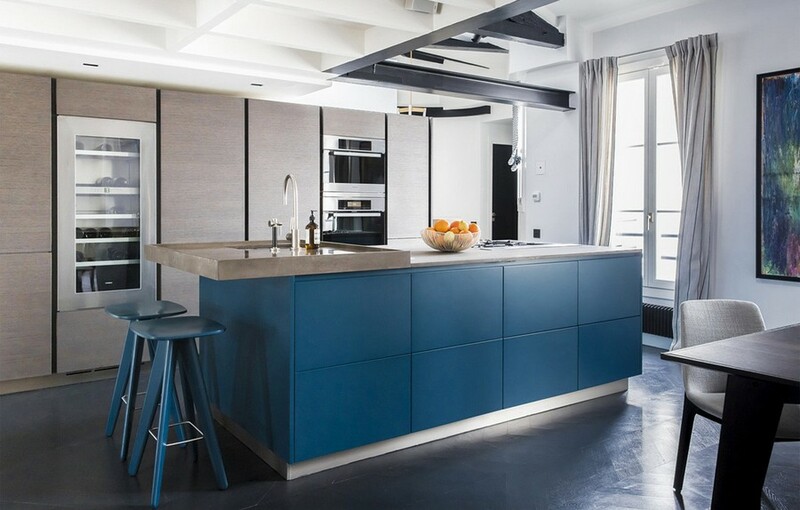 Leicht Company, which is one of the most famous German producers of kitchen cabinets, set their choice upon pale blue shade of the sky. To our mind, its glossy push-to-open cabinets would look equally great both in contemporary-style kitchens and in interiors inspired by the 1950s. 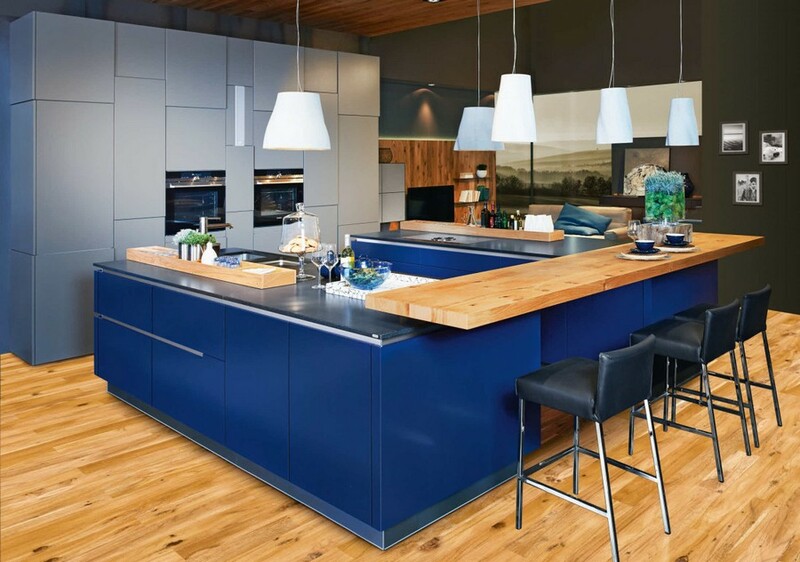 As far as kitchen interior design trends are concerned, we can’t but acknowledge that the leading trend-setter country in the industry is Germany. 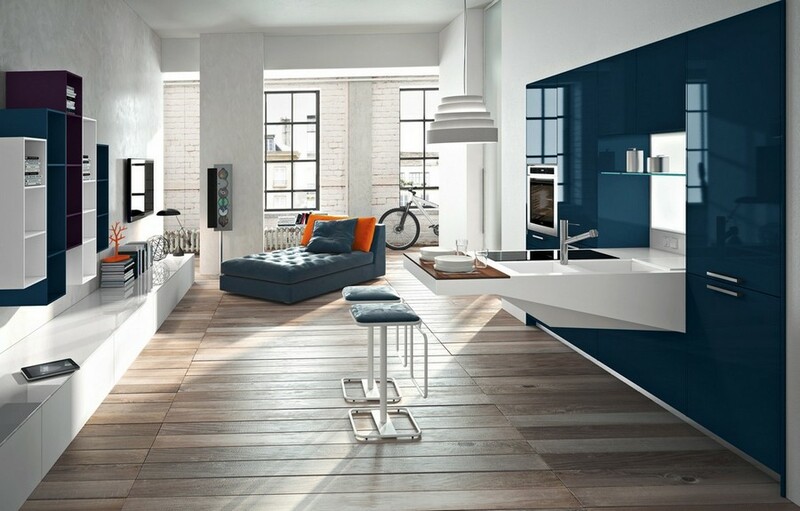 Thus, Allmilmo factory from Zeil am Main gives preference to the “electric” hue of blue. 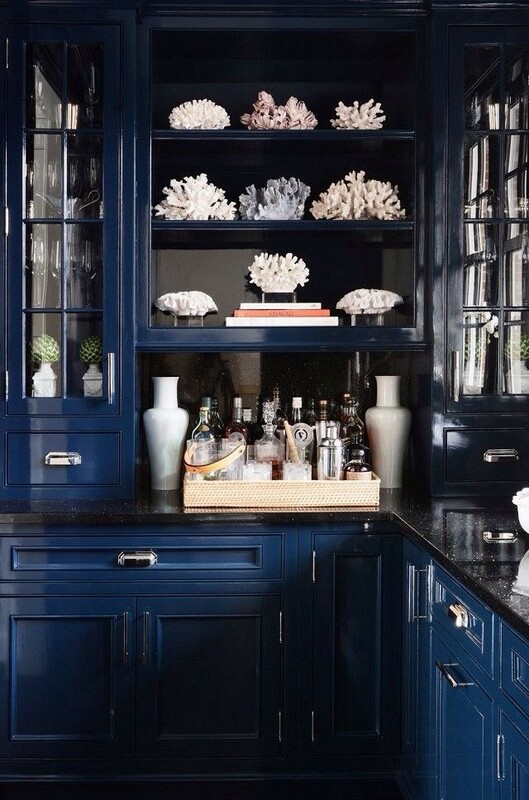 We’d like to pay your special attention that on most images that you will find in our post, blue is applied exclusively to base cabinets, not to the entire set in general. 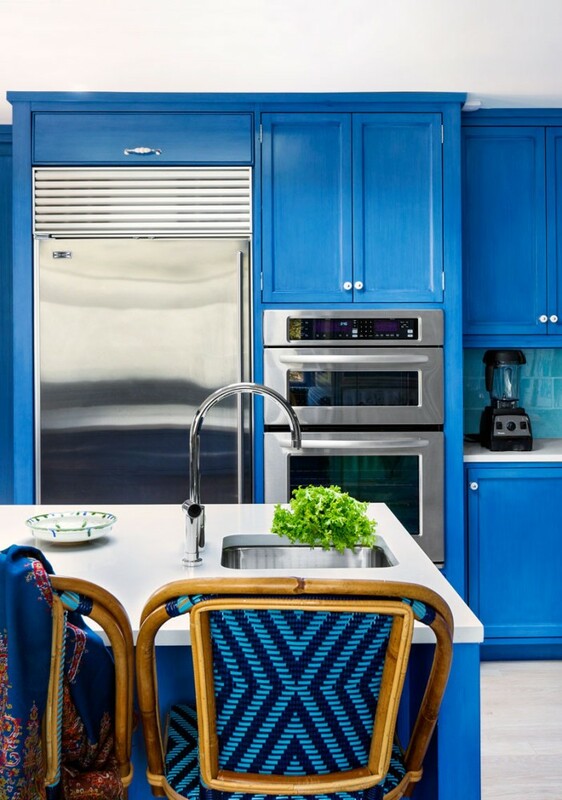 The point is that total-blue top and base cabinets are very likely to “overload” the room with this pretty active color. And this very example was prepared by the German factory Ewe. 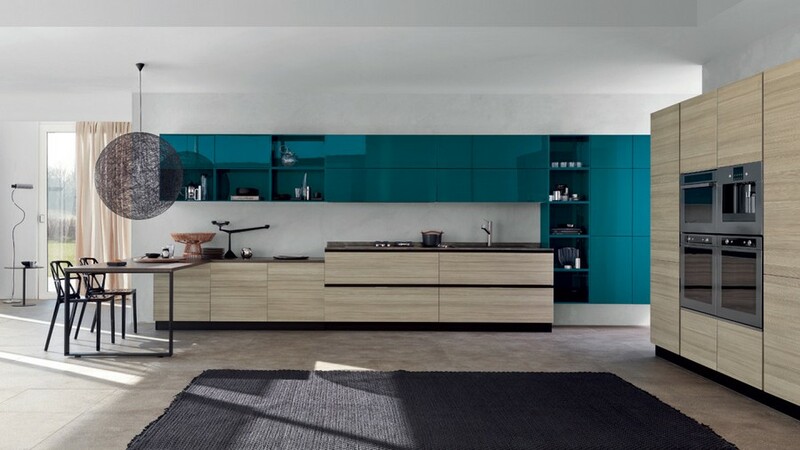 This extremely beautiful color of kitchen cabinets is offered by Mobalpa mill from France. You might be surprised to know that this splendid shade of blue is frequently referred to as “petroleum”. It was chosen by Snaidero factory from Italy. 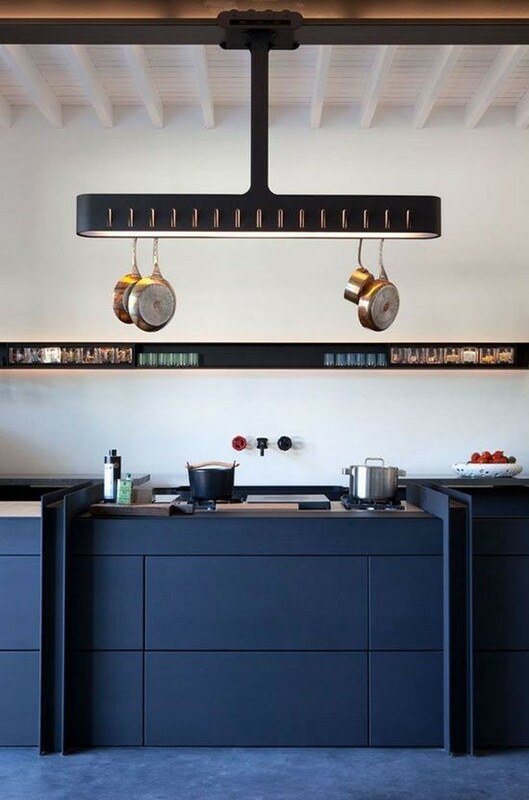 This unusual blue hue of German kitchen sets by Nolte has a slight note of smoke. 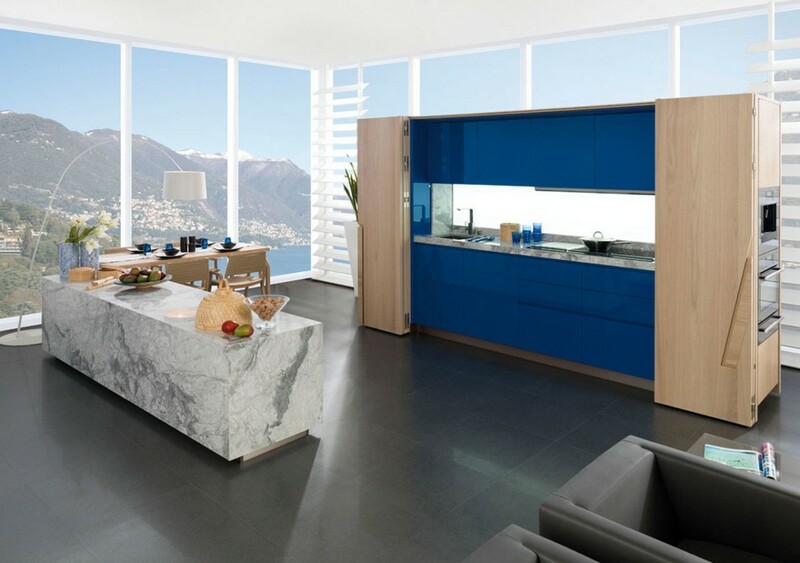 If you don’t mind glossy blue cabinets, feel free to choose this Spanish set by Porcelanosa Grupo. And this phantastic shade of blue is a golden mean between green and blue and was dubbed teal in the honor of ducks with similar feather color. Though it was a top trend in 2015, in 2017 it still looks very fashionable and stylish. This very set is produced by an Italian company Scavoloni. 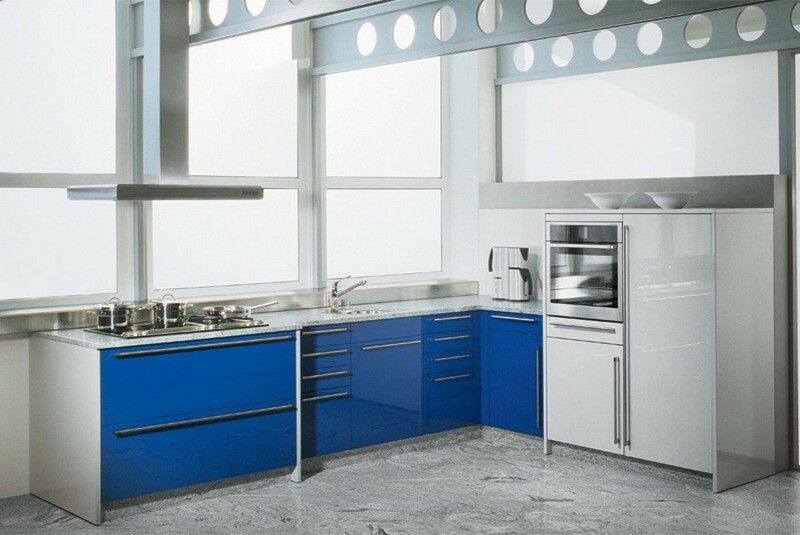 One more Italian manufacturer of kitchen solutions, Varenna, may also boast having a very beautiful shade of blue. Their cabinets are not just matte, they seem to be finished with decorative textured plaster that beautifully plays in the light. 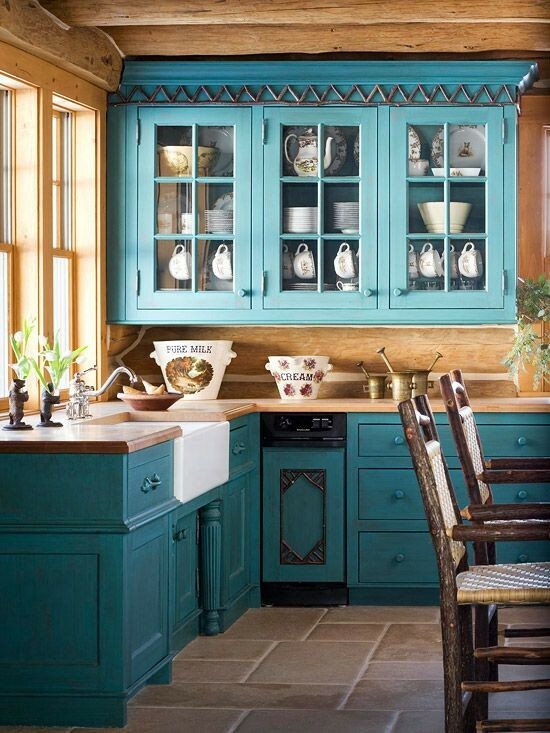 In the countryside blue kitchen cabinets set the mood of sweet French Provence. And you may safely enhance this effect by painting flowers right on them. 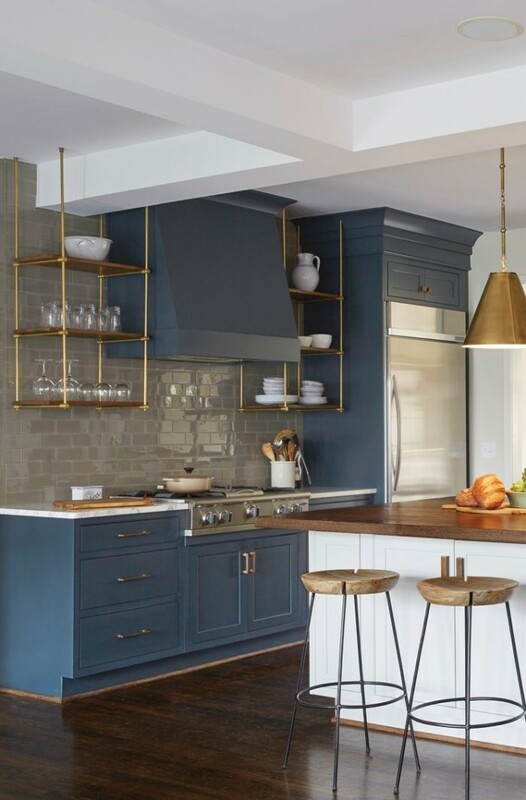 Saturated blue looks especially spectacular in the company of bronze, nickel or copper. You’d better set your choice on one of these metals and select knobs, handles, lamps or a faucet made from this material. If you don’t mind dark kitchen solutions and wonder what color of the worktop to choose, consider having a black backsplash and countertop. 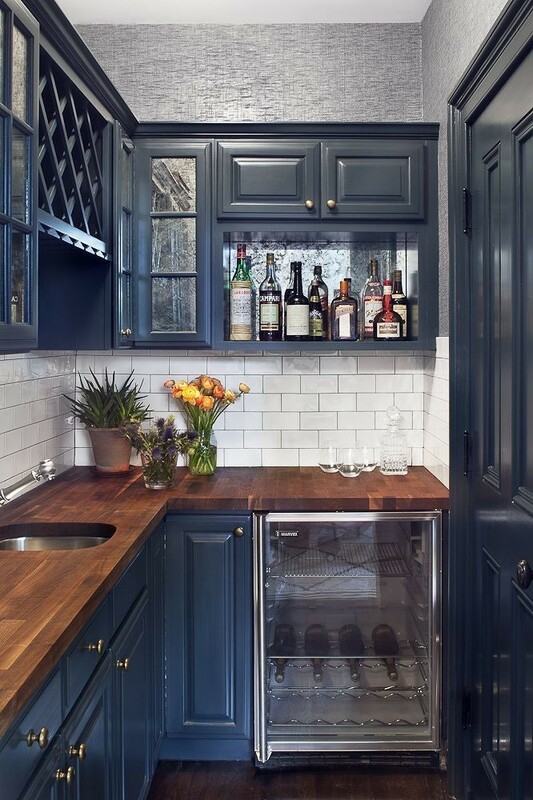 This combination looks stylish, but it’s recommendable to balance it with open racks or glass cabinets with white details, like on this image. 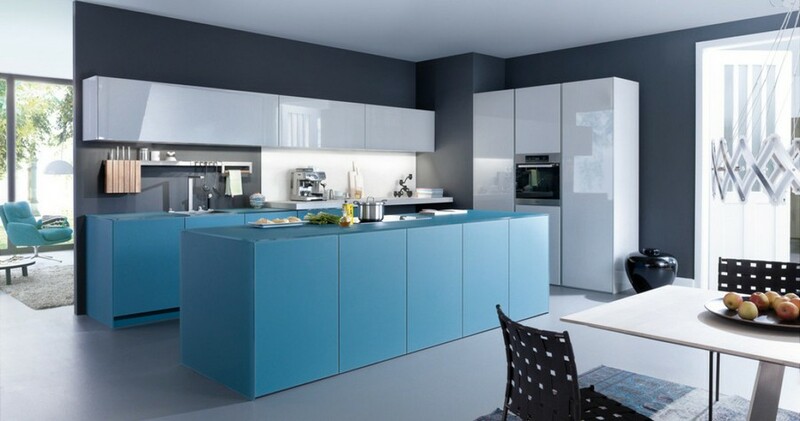 And if you want something light and bright, have a look at this sky blue kitchen set against a white backdrop. 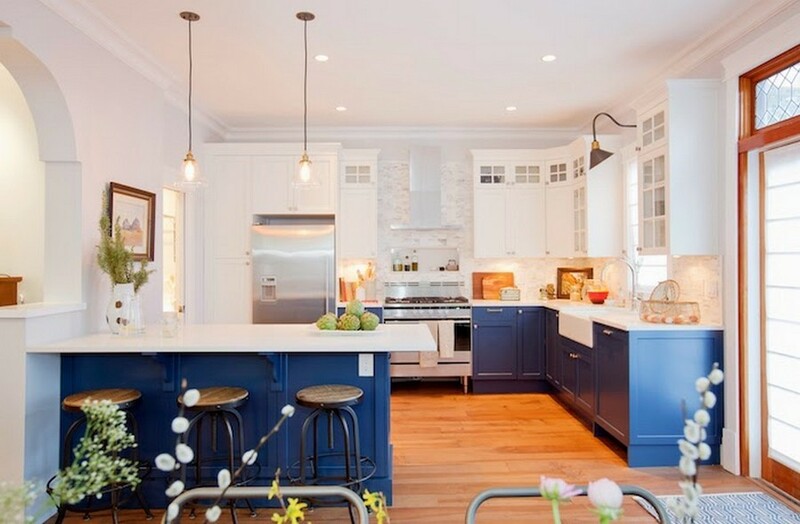 If you’re looking at your new blue kitchen set and feeling like it doesn’t match your interior, try to paint a window sill and frames the same color. A win-win option for those who can’t dare to use saturated shades in the kitchen is such a bi-color set with a neutral background. A small kitchen should be light. Failing this, it will look even tinier. 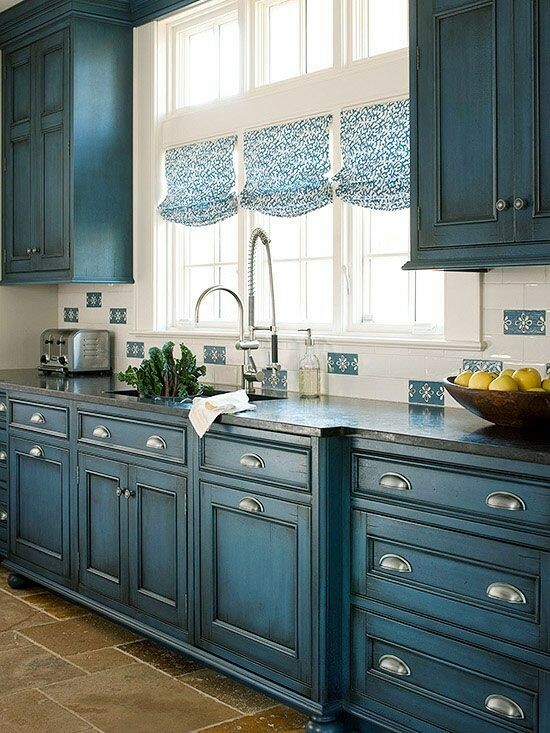 However, if you don’t want to be an owner of a kitchen set that is both small and dull, get yourself blue cabinets. 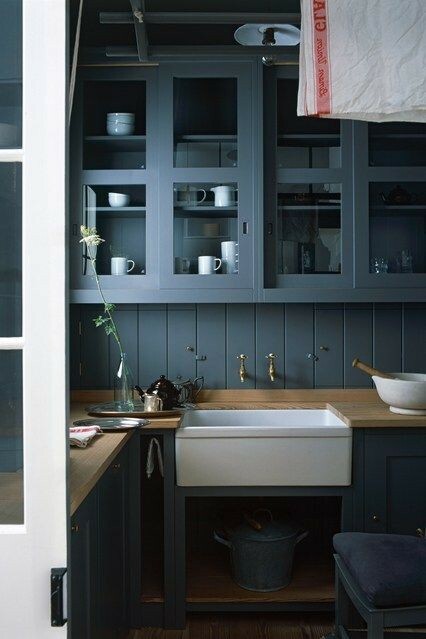 A wooden blue kitchen is a stylish and very cozy solution. Wooden cabinets, a wooden backsplash and a wooden countertop – all of this doesn’t look too much thanks to the warm natural shade of solid wood. Kitchen sets without top cabinets are becoming more and more popular. However, the interior should be given some verticality anyway. On this image the issue is handled by means of a narrow horizontal recess and a ceiling-mounted pan holder. Nowadays classical American-style kitchens with a touch of patina are given a second life. This trend is even more enhanced by the rapidly growing production of retro faucets and kitchen appliances in style of 1960s. 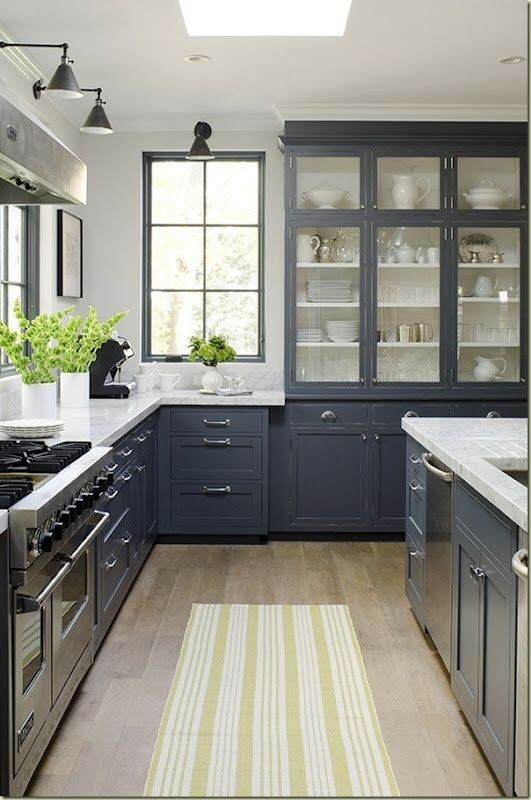 Matte blue cabinets are ideally matched by chrome, bronze or nickel. White marble and dark wood emphasize each other’s beauty and create a finished organic composition.